One more time now. Back to the topic of what makes baidarkas flexible and why one would make a baidarka flexible. This I hope to be a definitive treatment of the topic, by me anyway. I touched on this in a previous post prompted by a visit to the Phoebe Hearst Museum of Anthropology at the University of California in Berkeley. What I discovered on that visit were a bunch of modification to the Atkan Iqyax^ in the museum collection, apparently made to reduce the flexibility of its frame. There are some accounts on the topic of flexibility that indicate that the Unangan builders tuned the flexibility of their iqyan to suit conditions. High flex iqyan were built for rough water conditions and low flex iqyan were built for smooth water conditions. The flex of any given iqyax^ couldn't be modified on the fly but as the frame in the Hearst museum indicates, flex of a flexible iqyax^ could be reduced by modifications to the frame when the skin was off. 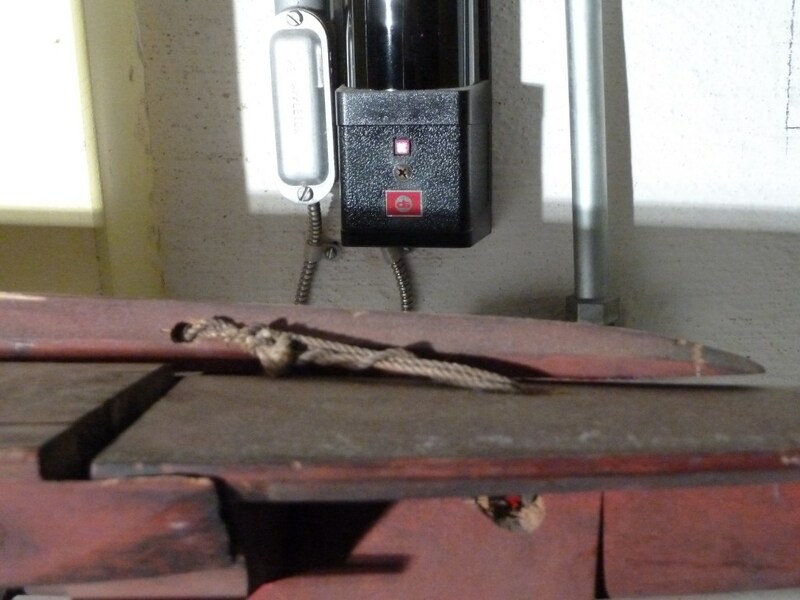 On a related note, Father Veniaminov commissioned the building of an iqyax^ with bone shims in Unalaska roughly 200 years ago when there were still people who knew how to build such boats. His informants told him that the shims increased the speed of the boats. When he tested the iqyax^ with the shims, he found that it was no faster than an iqyax^ lacking the shims. But even though the test was inconclusive, it may be that he tested the boat only in smooth water conditions where the shims would offer no advantage. 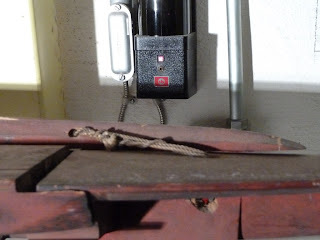 In addition, we do not know if his builders tuned the flex of the commissioned iqyax^ to take advantage of the shims. So without further ado, on to the details of how to tune the flex of an iqyax. Let us start with a picture. The picture shows two aspects of the iqyax^ frame. The top frame is shown in roughly neutral position such as the iqyax^ would assume on flat water. The bottom frame is shown in flexed position with the ends pushed up such as it might look at the bottom of a wave trough. Not shown is the frame with the ends flexed down, a configuration the frame would assume when going over the crest of a wave. The important thing to note is that the keelson is slightly curved in the relaxed position. Flexing the keelson more as in the bottom picture would move the tail fin and bow assembly closer together, closing their respective gaps between them and the deck end cross blocks. 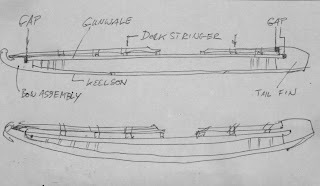 Likewise, if the ends of the frame flexed down, the keelson would straighten out and the tail fin and bow assembly would move away from the deck, increasing the size of the gaps. The question for the builder is how to tune the flex. Should the kayak in the neutral, unstressed position have gaps at the tail fin and bow assembly or should they be tight up against the deck cross blocks? My guess is that for optimum flex, there should be about a half inch gap both at the tail fin and bow assembly in the neutral position. This allows flexing of the keelson upward and downward. 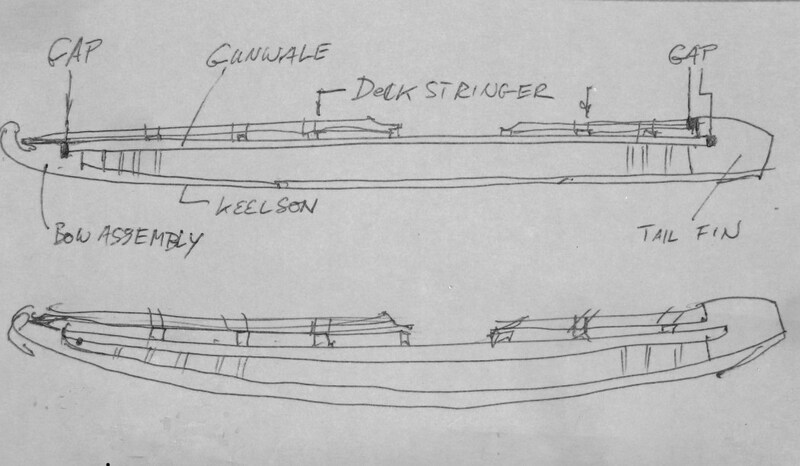 If there is no gap in the neutral position and the ends of the keelson flex upward, the keelson would exert pressure on the ribs and flatten them, thus distorting the hull. If the gap is there, the keelson ends can flex up and close the gaps without distorting the ribs. The parts of the frame are joined in such a fashion that the keelson, the bow assembly and the tail fin are all lashed or pegged together tightly so that they act as a single unit. That is, the parts of this assembly do not move with respect to one another. 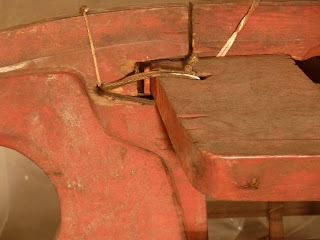 The keelson is lashed to the ribs, however, the ribs are loosely set into their mortises so they can pivot forward or backward as the keelson flexes. Also, the tail fin is slotted into the back of the rear cross block but is free to move forward or backward. Likewise, the rear deck stringer is not lashed to the tail fin to allow it freedom to move forward and backward. At the bow, the bow assembly joins the deck. 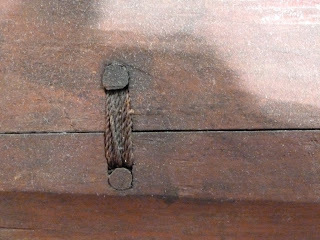 The deck plate joins up with the ends of the gunwales but like the tail fin, can move forward or backward, opening up a gap in the process. The picture shows the gap between the end of the deck on the left and the bow plate on the right. The deck stringer has been lashed to the bow assembly, a modification to limit the motion of the bow assembly away from the end of the deck. The notch in the tail fin mates up with the tail cross block. The lashings between the tail fin and the cross block are an add-on and limit the ability of the tail fin to move forward and backward. This picture shows one of the two lashings that join the tail fin to the keelson. This joint is quite rigid so that the tail fin would move with the keelson rather than sliding back and forth on the keelson. So to recap, to build a flexible iqyax^ the key is to allow the tail fin and the bow assembly to move closer to or away from the ends of the deck as the keelson shortens as it is flexed or lengthens as it is straightened. To allow internal movement of the frame also requires the cooperation of the skin. If the ends of the kayak are to move in and out, the skin must have enough stretch to allow this motion. Modern synthetic skins may or may not have enough stretch to allow motion of the frame. Also painting the synthetic skin with a sealer that penetrates the skin tends to glue the skin to the frame, essentially preventing internal motion of the frame and cancelling any structural allowances for frame motion.